The Weinstein Company will be hosting a screening followed by a live Q & A on Monday, November 25th with the cast of their highly anticipated movie, August: Osage County in theaters December 25, including Meryl Streep, director John Wells, writer Tracy Letts and fellow cast members Julianne Nicholson, Juliette Lewis, Margo Martindale, Chris Cooper and Dermot Mulroney. The cast will be on-site for the live, interactive Q & A session to be held in New York City at AMC Loews Theater Lincoln Square 13, 1998 Broadway, NY, NY 10023. The screening is to begin at 8:00 PM EST with the live-streamed Q & A following at 10:00 PM. Moderator John Horn of the Los Angeles Times will discuss the making of the film with the cast and incorporate fan questions who can participate in the full Q & A by visiting http://www.facebook.com/weinsteinco. Promotion on “August: Osage County” continues with three new clips from the film, all featuring Meryl and most of its ensemble cast. Click the previews below to watch all clips. Awards season is knocking on the door, so it’s not surprising that both the stars are praising each other (and, in this case, their famous producers as well). Julia Roberts presented George Clooney, who has co-produced “August: Osage County” with the Britannia Awards by BAFTA Los Angeles, and recited a letter that Meryl Streep had given her to read at the ceremony. George is like the dream boyfriend you have right out of college – sophisticated, older, knowledgeable about the ways of the world unlike all the callous, dopey undergraduates you so recently dated. And yet he is utterly, completely, thoroughly devoted, amazingly, to you. He calls, he writes, he charms, he disarms, you are in love, you are his socket. This is the guy. And then… you find out he has been hooking up in the past few months with women who look just like Cate Blanchett, Julia Roberts and Valerie Jarett. You are shocked, shocked and yet somehow you can never ever be really mad at him. George is everywhere and all at once and somehow never shows a dent on his bumper. I had many imaginary conversations with Meryl about working together…When a person goes from being on a pedestal in your mind, to even cooler, better, and more fabulous up close, you get to understand them a little more intimately. “August: Osage County” premiered at the AFI Fest on Friday. While Meryl Streep and Julia Roberts were absent, producers George Clooney, Grant Heslov, and most of the ensemble players attended the festival. The reviews so far focus on the film’s Oscar buzz (and how Meryl and Julia should both be considered as co-leads), but here are some writings that focus on the film. “August: Osage County” releases US theaters on December 25, 2013. A first in-depth report from the London press conference for “August: Osage County” has been published by the Philippine Daily Inquirer and features a lot of interesting quotes by Meryl on both “August” and “Into the Woods”, which was filmed at the time of the conference in London. Filming “Into the Woods” in London and promoting “August: Osage County” was putting Meryl Streep in two conflicting moods. “I feel like I should have two heads because I’m so into this music, place, magic that’s ‘Into the Woods,’” said the world’s preeminent actress with a lilt in her voice, exulting in her experience so far in playing The Witch in director Rob Marshall’s adaptation of Stephen Sondheim’s musical. She is dressed all in black for this early evening interview at The May Fair Hotel in London. In “August,” coincidentally another adaptation of a play (by Tracy Letts who won a Pulitzer Prize for this), Meryl plays Violet Weston, the acid-tongued, pill-popping matriarch of a bickering family in Oklahoma. The reason I did [August] was that a very dear friend said to me, ‘You had a great mother. She gave you your appetite for experience, curiosity, sense of humor. Your mother sang in the kitchen and mine hit me. Your mother made you feel you could do anything. Mine made me feel like I couldn’t do anything. You have to do this for me and for all the girls like me who had bad mothers, who made it in spite of that, who got out, and for all the ones who didn’t and to let them know it’s OK to leave that behind.’ She really made a case. I thought, OK, because when you’re a young actor, you think, oh yeah, it’ll be so cool to imagine having cancer and what’s it like to be close to death and then your family hates you…I really want to take that all on. Meryl also talks about the character of The Witch in Sondheim’s “Into the Woods”. The metamorphosis in ‘Into the Woods’ is [of] a witch who sets the whole machinery of impossible tasks in motion so she can have her wish, which is to not be ugly. Her mother put a curse on her. It’s very like Violet. Her mother put a curse of ugliness on her because somebody stole the beans, the baker’s father. So her metamorphosis is that Rapunzel, [whom] she loves more than anything in the world, will love her because she’ll be beautiful. Of course, women think that if they’re beautiful, they will be loved. The thing is, you can get your wish and Rapunzel will still hate you. It’s such an interesting problem that Sondheim sets up. Everybody has a wish, everybody gets their wish. That’s just the end of the first act. Afterward, what happens after it all shakes down…it’s an ambitious thing. The complete article can be read over at the Philippine Daily Inquirer. Two new production stills from the upcoming “August: Osage County” have been added to the image library. One has been added a couple of days ago, the other one has just been sent in by Joan with many thanks. Click the previews to launch the last added pictures. “Osage County” will be screened this November at the Napa Valley and the St. Louis International Film Festival. Edit: Three more pictures have been added to the image library with many thanks to Juha for the heads-up. Last week, Meryl has attended a press conference for “August: Osage County” in London. You can view pictures in the image library. Many thanks to Lindsey for sending them in. As previously reported, the cast of “August: Osage County” has been honored as Best Enemble cast at the Hollywood Film Awards. Julia Roberts was honored as Best Supporting Actress as well. 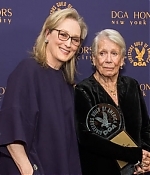 Unfortunately, Meryl was a no-show at the ceremony, but most of her castmembers attended and took the stage to accept the award. You can watch their speech, held by Chris Cooper and Margo Martindale here. The cast of August: Osage County will receive the Hollywood Ensemble Acting Award at the 17th annual Hollywood Film Awards, the first awards show of the 2013 season, on Oct. 21 at the Beverly Hilton, The Hollywood Reporter has learned. John Wells’ big-screen adaptation of Tracy Letts’ Tony- and Puliter Prize-winning play features a star-studded cast, including Meryl Streep, Julia Roberts, Julianne Nicholson, Juliette Lewis, Dermot Mulroney, Benedict Cumberbatch, Ewan McGregor, Chris Cooper, Margo Martindale, Abigail Breslin, Sam Shepard and Misty Upham. August’s producers include George Clooney and Grant Heslov, who also produced last year’s best picture Oscar winner, Argo. Many thanks to Glenn for the heads-up.